Home | News | Launching of a new plant! Lactalis Ingredients opens a new state of the art facility dedicated to infant nutrition. 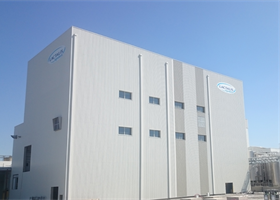 Based in France, our brand new plant is able to provide different dairy ingredients from WPC 35 to WPC 80 and lactose, all compliant to infant formula requirements. From the milk and whey collection to the end products, we pay a particular attention to fully control the hygiene all along the chain so as to garantee very high quality products. Lactose, as a staple in infant formula, has to be suitable to every stage and to every kind of process. Our lactose targets infant nutrition that requires the highest microbiological standards to ensure food safety. Produced from a new specific process designed to purify and enhance the lactose crystallization, our lactose perfectly meets dry mix process and is suitable to 1st age, follow on and growing up milk formulas. The very white colour is obtained thanks to a discoloration step and thus provide the whitest colour and a very low ash content for an overall very high purity.